The beginning of the end for Powertech's Centennial Project? of landowners disparage proposed uranium mining project. 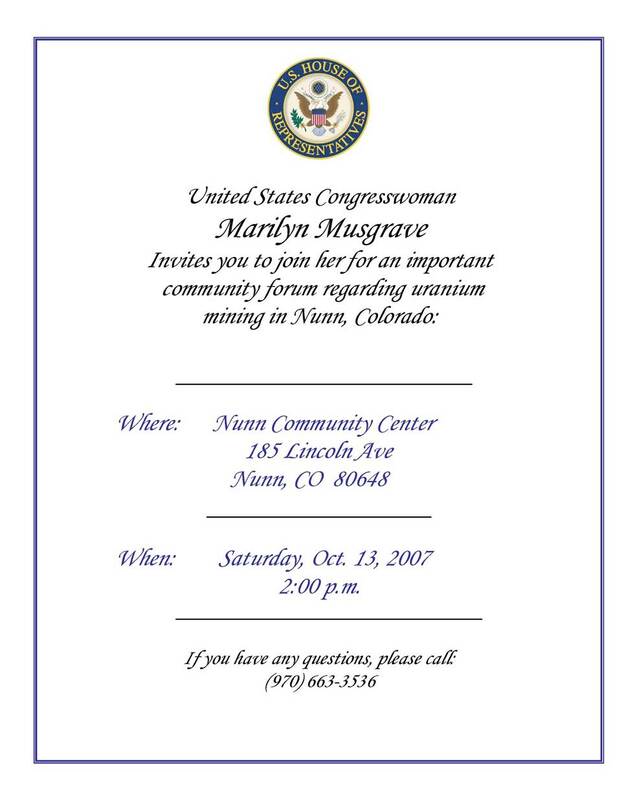 U.S. Rep. Marilyn Musgrave, R-Colo., came out in opposition to a proposed uranium mining operation in northern Weld County on Saturday following a meeting in Nunn that drew 250-300 people. "I want to come out with a public statement expressing my opposition to this," Musgrave said at the conclusion of the more than two hour meeting at the Nunn Community Center. The Centennial Project, north of Nunn, contains 5,760 acres of land which Powertech Uranium Corp., a Canadian company, has purchased the mineral rights. The company estimates 9.7 million pounds of uranium lie beneath that land. Most of the people who spoke in opposition to the plan expressed concern about ground water contamination, the possibility of radio active material escaping into the water and air, and the devaluation of land, which many claimed has already started. Musgrave, after listening to the comments -- which included response by Powertech officials -- said she decided to oppose the plan because Powertech has no track record in in-situ drilling, which will be done by forcing a carbonated water solution into the strata of rock to mobilize the uranium. Many fear that would contaminate water in the massive Dakota-Cheyenne aquifer. The aquifer spreads beneath Nunn, Greeley, Windsor, Fort Collins, Wellington, Sterling, Fort Morgan, Longmont and Boulder. 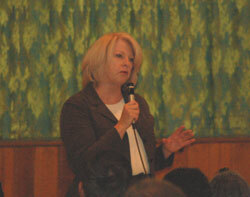 Musgrave said she was also concerned that taxpayers could be forced to clean up any contamination of the site which. A panel featuring Lilias Jarding of Coloradoans Against Resource Destruction, Kent Peppler, president of the Rocky Mountain Farmers Union, Dr. Cory Carroll of the Larimer County Medical Society and Jeff Parsons, an attorney with the Western Mining Action Partnership, gave an overview of the project. Jarding said there are 32 sites in Texas that have not been "returned to their original condition" from a similar mining operation, while Carroll expressed fear of health concerns to patients he sees on a regular basis. Parsons reviewed the permitting process Powertech must go through before any operation, and said Weld County is in a position to deny any of those permits. Peppler said his farm organization has not taken a stance, but members were gathering information. Carroll, whose organization is opposed to the project, said water contamination is his major concern. 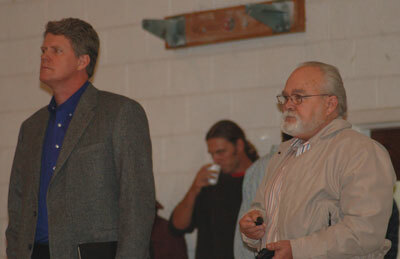 Residents of the area, however, left no doubt about how they feel about the proposal. Gary Voshel ranches west of Nunn and lives near where the mining would take place. He said he could not understand how he is limited to the amount of water he can pump from his wells, while Powertech seems to be able to pump 24 hours a day, seven days a week. "This is going to impact my life, my family's life and the livestock I have," he said. "I don't need any looters or polluters on my ranch." Lane Douglas, the project manager for Powertech, attempted to alleviate the concerns and said the company intends "to prove to every regulator that we well not have an adverse effect on the area. If we can't do that, then we won't be given a permit." A rally at the State Capitol in Denver today will feature Larimer County lawmakers who will announce proposed legislation to address the proposed uranium operation in northern Weld County. That rally will begin at 2 p.m. at the west steps of the Colorado State Capitol, 200 W. Colfax Ave., Denver. To vote on the question "Do you support the proposed mining for uranium in Nunn, Colorado?" in an online poll on Rep. Musgrave's website, click here.